Europe’s largest IT company recently issued a “zero email” policy; by 2014, Gartner predicts social networking services will replace email as the principal method of interpersonal communications for 20% of business users. 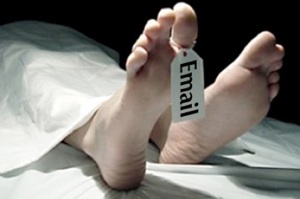 So, is email dead–and if so, does it deserve to be snatched from the grave? It sounds kind of crazy (or crazy awesome)–a company banning email for all its employees. But this is no item from News of the Weird. Far from it. The company that banned email is Europe’s largest IT company, one with 75,000 employees and $13 billion in annual revenue, which operates in 13 countries. The company, Atos, is the official IT shop for the Olympic games. Atos CEO Thierry Breton explained that “email is no longer the appropriate communication tool,” and that the “zero email” policy would be phased in over the next 18 months. Breton says he hasn’t sent an email in the past three years, and that Facebook, text, and the phone will replace email for his company, as they prepare for a new wave of usage and behavior. By 2014, the technology research group Gartner predicts social networking services will replace email as the principal method of interpersonal communications for 20% of business users. So, is email dead? Can we do something to change it? And should we? How did email get so broken, so noisy, and so damned annoying anyway? Think back to the emergence of the phone. At first it was expensive and costly to use the phone for telemarketing. Imagine if all day long from morning till night your phone rang with an endless back-to-back stream of offers to “make money while you sleep,” update your FedEx Account, or transfer a large amount of cash from a Ethiopian businessman. How long would it be before you ripped the phone wire out of the wall? About 10 seconds. But by the time the phone costs had come down, the federal government had begun to give telephone customers the protections to ban unsolicited telemarketers. Simply put, the cost of the phone made it too expensive for large-scale spammers. But email doesn’t cost anything–for the sender, that is. For the receiver the costs are painfully real. Time, sanity, and attention span are all suffering. Which is why I think it’s time for the United States Postal Service to take over the management, operations, and back-end billing for the users of email. How would this work? I’d propose that person-to-person communication be very low-cost, perhaps a few pennies per email. But business communications would pay a premium. And commercial advertising would be expensive, meaningfully so. This would stop a company from sending me advertisements about breast enhancements, since a simple bit of logic would say I’m probably not a customer. And perhaps most punitively, receivers should be able to bounce an unwanted commercial email and charge the sender a punitive fee for a mis-targeted outreach. So, what’s wrong with this plan? Lots, of course. The Postal Service has no legal right to control email. But I have to believe that Congress could find a way to find it in the public interest to both save the Postal Service and take some useful role in creating a reasonable governance system for email. Email was once wonderful. A magical, efficient, direct way to connect with people and share ideas and information. It’s not gone yet, but it’s facing near-term extinction. Email needs a traffic cop, with the power to manage the electronic commons and keep things running smoothly and fairly. I say save email. And I think my friend Pete the Postman is just the man for the job.